Parathyroid problems (hyperparathyroidism) affect about 1% of all women over 50, and about 1 in 200 men. Despite the fairly common occurrence of parathyroid problems, many doctors over look it and have trouble diagnosing hyperparathyroidism. Every day we see doctors and endocrinologists struggle to diagnose routine cases of primary hyperparathyroidism when it is painfully obvious to us. More often than not, a delay in diagnosis of hyperparathyroidism causes the patients to suffer needlessly with fatigue, depression, anxiety, heart arrhythmias, osteoporosis, bone pain, and kidney stones. These little parathyroid tumors take away the joy of life. As we've discussed in some of our other blogs, when the diagnosis of hyperparathyroidism is delayed over a decade or more, patients can develop kidney failure and even increase their risk of developing a number of cancers. "You're blood calcium is high, I'm going to send you to see an endocrinologist"
1) "Your calcium is not that high." We have several blogs on this topic. The height of the calcium (how high the blood calcium has become) is a terrible estimate of the severity or urgency of hyperparathyroidism. A patient with a blood calcium of 12.0 mg/dl does not have worse hyperparathyroidism than a patient with a blood calcium of 10.8. It is the duration of high blood calcium (over 10.0 in an adult over 35) that causes the problems. 2) "Your vitamin D is low. You just need to take more vitamin D."
Low vitamin D confuses about 50% of endocrinologists and they think the patient has "secondary hyperparathyroidism"… that is, the parathyroid glands are all over-active because the patient has a low vitamin D level. This is impossible. There is no mechanism by which a low vitamin D can result in a high blood calcium (vitamin D is required by humans to absorb calcium from the foods we eat). We have an entire page of our website on this topic: Low Vitamin D and the Diagnosis of Hyperparathyroidism. 3) "You just need to stop eating so many high-calcium foods." This is just plain silly. The reason God gave us 4 parathyroid glands is so they would control the calcium in the normal range (mid 9's for us adults over 35 years old). You cannot eat too much calcium containing foods that will cause your blood calcium to go high. Your parathyroid glands will not allow that (if they are normal). This is the silliest and most ignorant thing a doctor could ever say. 4) "We don't do anything until the calcium goes above 12." If your doctor says this, then you need a different doctor. This is pure BS and is a strong signal that your doctor needs to do a lot of reading. This is ignorant and bad medical care. If you have blood calcium over 12, then you are almost certain to have had a parathyroid tumor for a decade or more. The exception is teenagers who very frequently have calcium levels over 12 mg/dl. Only 4% of adults with a parathyroid tumor have even one calcium level over 12, and they are the ones with old tumors. 5) "I have lots of patients with high blood calcium. We don't do anything about that." Run. Don't walk. Run-and get out of that office. Nothing more needs to be said. Get up and get out. 6) "This is a normal calcium level for you. See, sometimes it goes into the normal range." 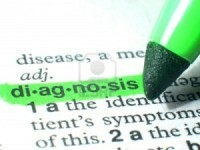 Diagnosing hyperparathyroidism correctly means you need to understand the problem at hand. The parathyroid tumor (it is a real tumor that causes hyperparathyroidism) is making parathyroid hormone (PTH) in an amount that it wants to at any time. The amount of hormone the tumor produces is random. Therefore, almost all patients with hyperparathyroidism will have PTH levels that are variable, going up and down from one measure to the next, and with it, calcium levels that are variable, some higher and then some lower. This is random. Those of us with normal parathyroid glands do not have PTH or calcium levels that go up and down, thus we can use this phenomenon to help us make the diagnosis. Most people with hyperparathyroidism have calcium levels that are normal every now and then. Remember, normal for an adult over 35 years old is BELOW 10.0 mg/dl (adults "live in the 9's"). See our Blog on this topic. See Parathyroid.com on this topic. 7) "It's just menopause. You need to get out and exercise more." A lot of our lady patients actually believe their doctor when he says this-for a while. After all, the patients don't know how to diagnose hyperparathyroidism. Once they read about it however, they get offended at the doctor who said this. Yup, you have a hormone problem-you have a parathyroid tumor and a parathyroid hormone problem! 8) "Your parathyroid hormone (PTH) is normal, you can't have a parathyroid problem." Diagnosing hyperparathyroidism is easy in almost all cases-if the doctors are paying attention and if they don't make some assumptions that are not true. Confusion by a normal PTH level is the fourth most common mistake we see endocrinologists make (the first three are: a) they think a calcium of 10.5 is normal or just a little high so it can be watched, b) the scan is negative so there is nothing to do at this point, and c) the low vitamin D is the problem, so just take more vitamin D). A high parathyroid hormone (PTH) level is absolutely not required to make the diagnosis of primary hyperparathyroidism. In fact, in our publication a few years ago on calcium and PTH levels in 10,000 consecutive patients we found that almost 18% of people with hyperparathyroidism (cured with removal of a parathyroid adenoma) never had a single high PTH level. Importantly, their PTH is not suppressed. If the calcium is high and the parathyroid glands are NOT the cause of it, then the normal parathyroid glands will become dormant (asleep) and the PTH will be very low (almost always below 20 pg/ml). Thus 18% of people with hyperparathyroidism (and need a tumor removed) have high calcium and a PTH that is in the normal range-but it is "inappropriately normal", in that it is not suppressed. High calcium and a normal PTH means a parathyroid tumor is present in virtually all cases. Get the Calcium-Pro App and it will figure this out for you. 9) "You don't have kidney stones or a broken bone yet, so we can just watch this for a while." This bad advice might have been prudent in 1985 when parathyroid surgery took 4-6 hours and the chance of never talking again after a parathyroid operation was 5-6%. Now that nearly all patients can have all four parathyroid glands looked at during a mini-operation that takes less than 20 minutes in most cases, there is no reason to wait until somebody breaks a hip or has a dozen kidney stones before we take the parathyroid tumor out. Part of this problem is that the doctor isn't sure of the diagnosis of hyperparathyroidism and they are "treading water". When doctors don't know what to do, they do nothing and say "let's watch this for awhile". Watch the 4-gland MIRP mini-parathyroid operation that takes 13 minutes. 10) "Your scan is negative, so we don't need to do anything-we can just watch it." As noted above, this is one of the top three mistakes doctors, including endocrinologists make while diagnosing hyperparathyroidism. Part of this problem is because of their local surgeon's reluctance to operate on people with a negative scan and the doctors have no choice but to say "we don't see a tumor on the scan, so no surgeon will operate on you". Look folks, scans are not accurate enough to make this kind of decision. We do NOT diagnose hyperparathyroidism using a scan. Scans cannot be used to diagnose hyperparathyroidism and scans cannot be used to determine who should or should not have a parathyroid tumor. When endocrinologists get a sestamibi scan they delay parathyroid surgery by 3 months to 2.9 years. If the scan is positive it delays surgery by nearly 3 months. If the scan is negative it delays surgery by almost 3 years. Stop getting scans. Scans cannot be used to make the diagnosis of hyperparathyroidism because 60% of parathyroid tumors do not show up on a scan. Even when the scan is positive it is wrong just over 50% of the time. How Do We Diagnose Hyperparathyroidism? No doctor bashing here! Although the overall tone of this blog appears somewhat negative and it seems as though we are "bashing" our fellow doctors, this is not the intent. The doctors just aren't taught about this-and-so much has been learned about this disease in the past 20 years that many doctors are just not aware. If there was a pill or a drug for hyperparathyroidism then you can bet the drug companies would be educating all of us how to diagnose hyperparathyroidism (just like they educate us about erectile dysfunction, diabetic leg pain, and high cholesterol). Surgeons have a big advantage because we get to look at these little glands all day long. My partners and I have seen the parathyroid glands in over 21,000 patients, so diagnosing hyperparathyroidism has become second nature to us. We work closely with hundreds of endocrinologists from all over the United States (and many other countries). We know many fantastic endocrinologists.But, the fact remains, the number of doctors who have no clue how to diagnose hyperparathyroidism is far greater than those that are experienced and give great, appropriate advice. Be your own advocate. Get copies of your own labs from every doctor. Keep a folder of labs for everybody in your family. You are your own best health advocate! Follow the Norman Parathyroid Center on Facebook.